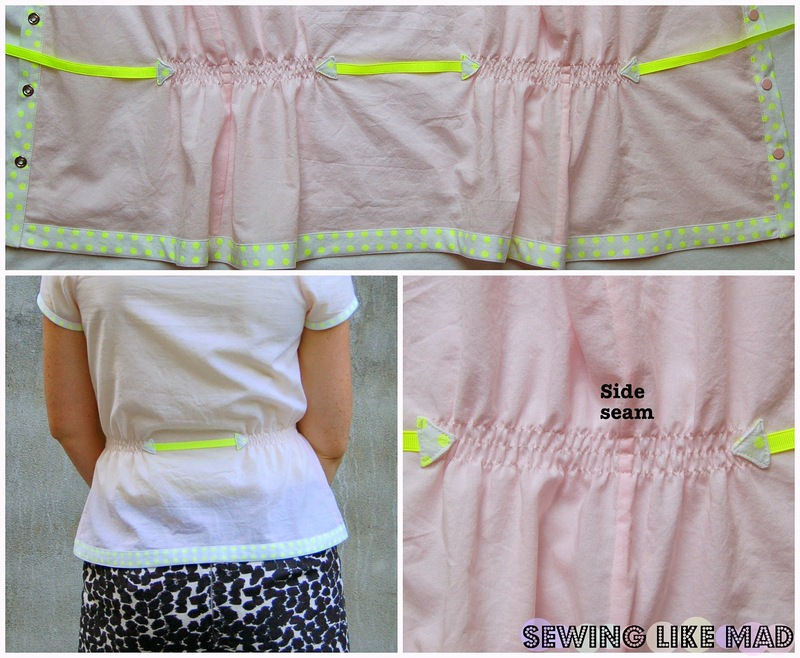 Sewing Like Mad: Sew homemade bias tape the easy way and with no pre-ironing. Sew homemade bias tape the easy way and with no pre-ironing. 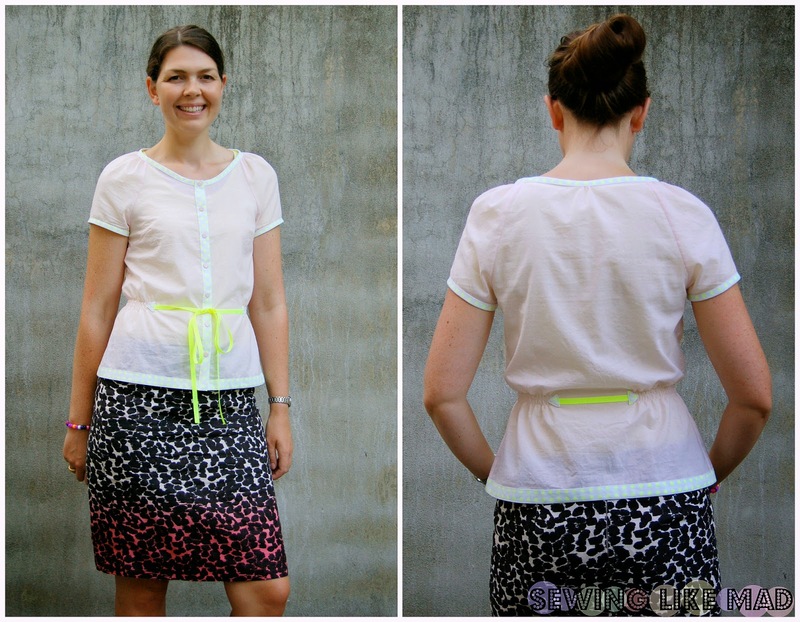 Today I am bringing home my July post for the Sewing Rabbit Creative Team. First I decided to design and make a top that used several options of bias tape. During the design and fitting process - which by the way gave me soooo much trouble for such a fairly simple top - I ended up making this shirring and belt combination instead of darts to make it fitted at the waist and I absolutely love that detail. More about that in the end of this post. Okay so what is this about? Well, you won't come around cutting your bias strips, ugh. 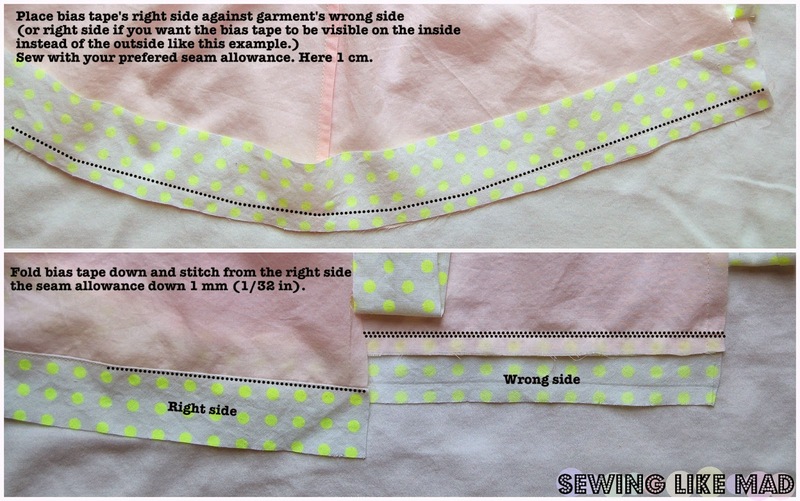 Before starting to cut you need to decide what width you want your FINISHED sewed on bias tape. On this shirt I decided to have a 1 cm (3/8 in.) width. So to determine how wide you cut your bias tape first you multiply your finished width with 4 (a bias tape ends up being folded four times, right) but because all that folding also takes some width away I add another like 0.5 cm (3/12 in.). That always seems to do the trick. *Finished Width of bias tape on your garment. But after they are cut you are ready to sew them on your garment. Below is the tutorial. Since I was working with a garment with gatherings it was necessary to make a pattern for the neck bias tape since the bias tape would be the finished length of the neck line. I also originally planned on gatherings at the sleeve openings but skipped it along the design process - but since I already made the pattern piece for the bias tape I just decided to keep it even though is was not necessary. 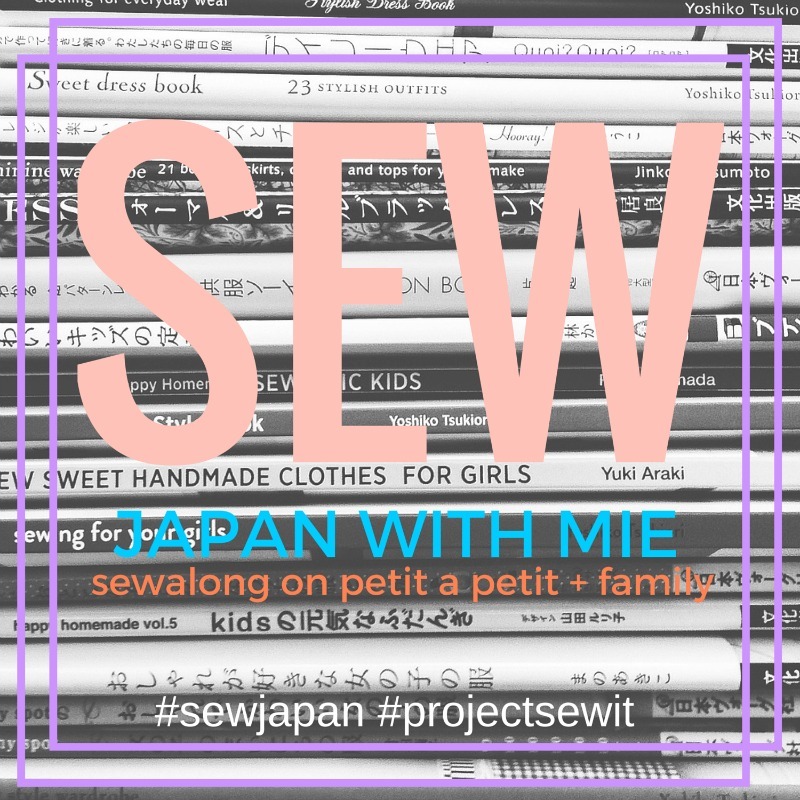 After flickering through my growing collection of Japanese Sewing Books for the 117th time the other day I noticed that they use the same technique for sewing bias tape. Yay, I love Japanese Sewing Books. Before I show you the other tutorial for the bias tape hem I just want to go through this top at bit more. The neckline is gathered only at the sleeves and a tiny bit at center back and has a placket center front with snaps. It is made with this ultra light baby pink cotton voile and for the bias tapes and plackets I used this cool cotton yellow neon dot from Michael Miller. Another great buy from Fabric Weekend LA at Michael Levine. The ribbon is gross grain. Okay, who is ready for another tutorial? Yay! 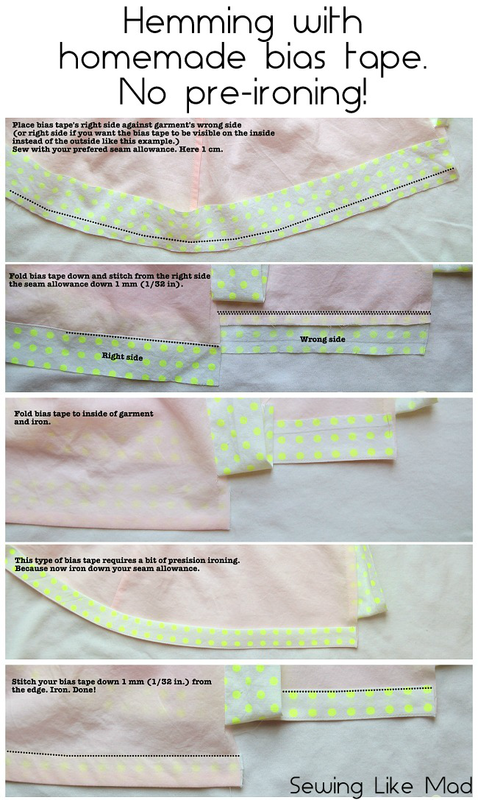 This one shows you how to hem garments with a wide bias tape. This technique can be used both on the outside of the garment to make a visible band or on the inside instead of either a facing or for a more luxurious alternative to the usual fold and stitch hem. To determine the width to cut your bias tape is super simple on this one. Last I want to show you some more close up photos of the shirring / belt combination. It honestly just happened a bit by coincidence. With my body type (narrow waist and wide hips/thighs) I know that accentuating my waist looks best on me. 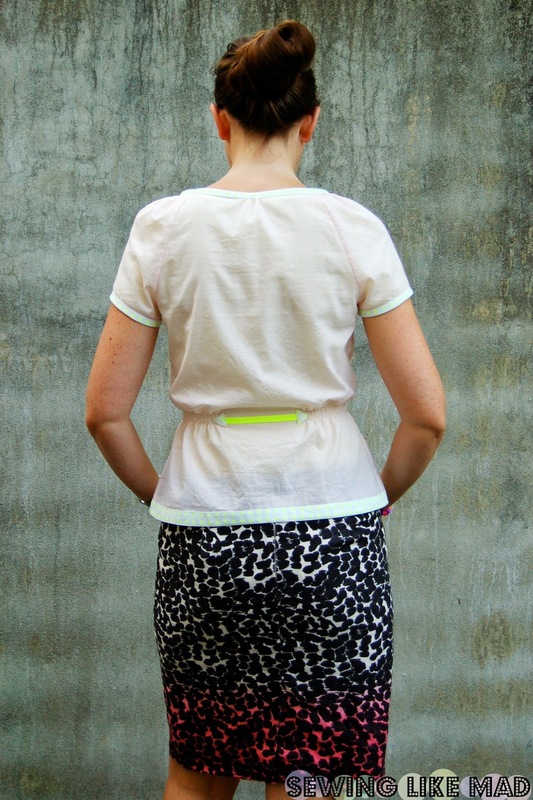 When drafting patterns you can use several methods to do that and my first idea was simply to add front and back vertical darts but discarded the idea because I think it can give a bit of a formal look that I did not want for this top. Another option is shirring. Now I was a bit worried about adding shirring all the way around the waist since the top has a placket and buttons. 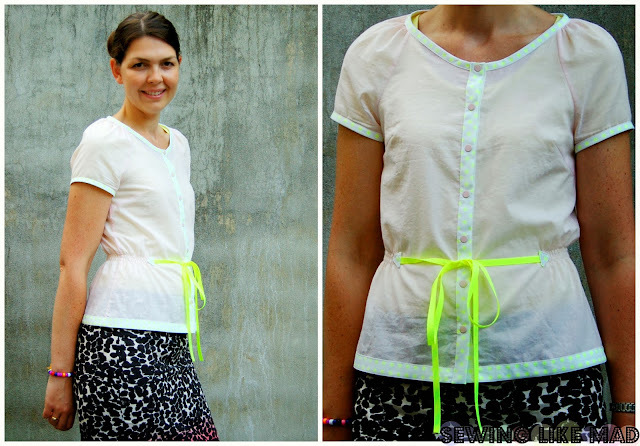 I was simply worried that the shirring would pull the two plackets apart - and an exposed belly button was not the look I was going for either. And well that's how I came to the idea of only adding shirring in the sides of the waistline. And when that was done...well, I am not even sure how the idea of making those little triangles and adding the gross grain ribbon came but I am happy with the result. I did not make a tutorial for it because well there is really no secret to it. What you see is how you do it. 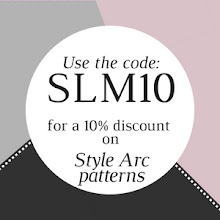 Three rows of shirring, sew and place the triangles and add the gross grain ribbon before you sew on the triangles. I will be happy to answer any further questions if this is not clear. You're gorgeous and so is your outfit! Love the neon details! You do such nice work. I especially like the waist. Great tutorial! I would love to be a fly on the wall of your sewing room. You know so much! I just noticed that you are wearing a super cool skirt. Didn't notice in July. :) :) Did you make that too? The shirt is great!